The NeuroTrition Conference is for anyone who wants to learn the connections between neuroscience and nutrition and how they affect our lives. This year’s conference is all about your brain and how to feed it, throughout your life! We'll also be examining the effects of cannabis on your brain, and what exactly your gut has to do with your brain. 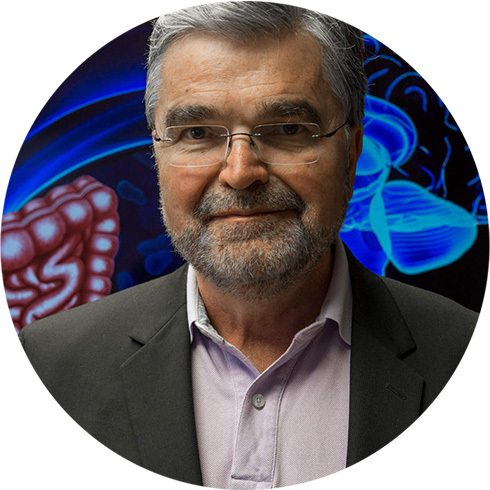 This conference brings you closer to renowned neuroscience experts (plus one famous gut doctor and best-selling author of The Mind-Gut Connection!). You'll get the science directly from them (instead of filtered through the media!) in an interactive, fun setting. The programming is designed to translate this scientific expertise into practical information that you and your family can use everyday. Enter our immersive NeuroLife Sessions, which showcase NeuroTrition client case studies and evidence-based protocols you can start using right away! We've also set aside plenty of time for you to ask questions and mingle with our speakers. To keep everyone energetic, we're doing a coffee break the right way, and serving up some tasty Brain Food snacks. At the end, Orsha Magyar will lead a big panel discussion where you can ask all your burning brain questions (last year was a lively debate, not to be missed!). We've jam packed the NeuroTrition Conference with value. In four engaging sessions, our NeuroSpeaker program will cover everything from baby brains, to adolescent brains, to adult brains. We'll also be looking at both the impact of cannabis on the brain and the role of the gut in brain health, throughout life. Our immersive NeuroLife Sessions will then translate the science into protocols that are easy to apply in your everyday life. Our interactive program also features a Brain Food Revolution panel discussion moderated by our Founder & CEO Orsha Magyar and plenty of time for Q&A -- so you can get answers to all your questions. And that's just the start. 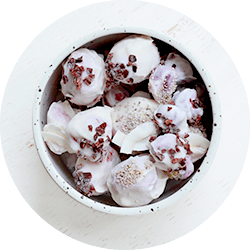 We'll also serve you three delicious Brain Food snacks (from recipes in our upcoming NeuroTrition E-Cookbook)! 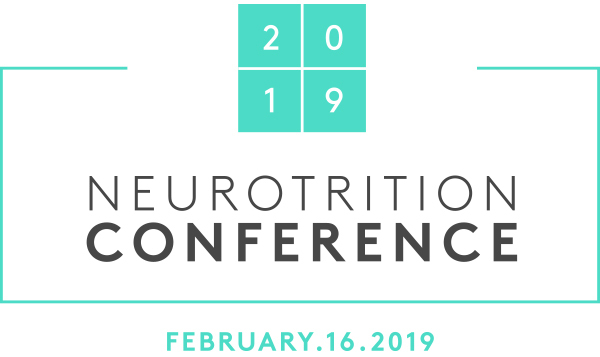 Reserve your seat at NeuroTrition Conference 2019! The core of our NeuroTrition Conference is the NeuroSpeaker Program. We've brought out the big guns – four highly renowned neuroscience experts – to help translate the latest research for you. The scientists will help you learn how your brain is impacted by nutrition (or lack thereof) across your life. Each session will start with a core presentation and include plenty of time for audience Q&A. And just so you know - they're all very approachable and friendly. No attitude here! After each speaker, our NeuroLife Sessions will take what you learned and put it into real life terms, complete with client case studies and NeuroTrition protocols that you can incorporate into your life. We all have heard the saying, “you are what you eat.” But are you also what your mother ate? Recent research has shown that a mother’s diet during pregnancy can affect the development of her baby’s brain. One reason for this is that the developing brain is readily impacted by the environment (think food, chemicals, or drugs). Importantly, parts of the brain are slower to develop, and are not fully mature until well in to our mid-20s! This means that these regions of the brain remain vulnerable to environmental challenges right through adolescence into adulthood. This engaging talk by Dr. Reyes, Associate Professor in the Department of Psychiatry and Behavioral Neuroscience at the University of Cincinnati, and NeuroTrition Science Council member, will present information showing how your mom’s diet during pregnancy or your diet during adolescence can affect your brain development and behaviour. Spoiler alert: Exciting new research suggests that one way early life diet affects the brain is by changing the immune response within the brain. Woah, did you know your brain even has its own immune system?!?. It sure does, and you’re going to learn about it and so much more! Have you ever looked at your teenager and wondered “What the heck is going on in that head of yours? ?” Well, it’s a lot, actually. Adolescence is a very special time of physical, cognitive, social, and emotional growth. This is reflected by tremendous changes in brain structure, function, and chemistry. During adolescence, the brain becomes more connected and specialized, and how different parts of the brain work together also changes during this time. Finally, the developing brain is very reactive to both environment and lifestyle. This represents a double-edged sword of increased learning and plasticity but also increased vulnerability to brain and mental health imbalances. Brain imaging has allowed us to look inside the brain for a better understanding of these changes structurally (anatomical magnetic resonance imaging [MRI] and diffusion tensor imaging [DTI]), functionally (functional MRI [fMRI]), and chemically (magnetic resonance spectroscopy [MRS]). 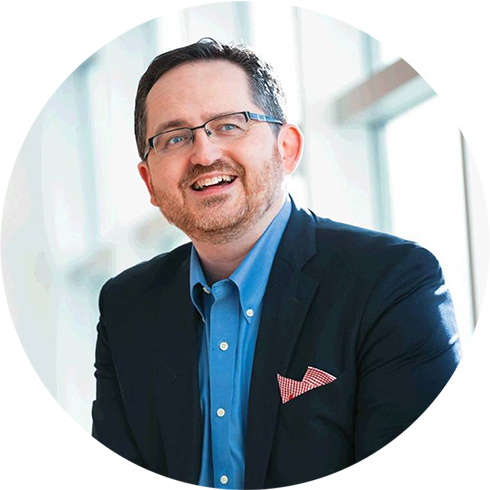 This fascinating talk will be led by Dr. Frank MacMaster, who is an Associate Professor of Psychiatry and Pediatrics at the University of Calgary and the Scientific Director of the Strategic Clinical Network for Addictions and Mental HealthTM for the province of Alberta. Dr. MacMaster will provide insight into how exactly the brain develops in teenagers and how this makes them so amazing but also so vulnerable to mental health problems. Since Canada was the first Western country to legalize the recreational use of cannabis, it has been on *everyone’s* mind. Right?!? Right. We know you want to know what’s up: is it so bad for you? Can it be good for you? Can you get hooked on it? Can it make you mentally ill? There is a lot of talk about cannabis, but with that a lot of misinformation, myth and hype in the media. So it’s really unclear how to disentangle reality from hyperbole. 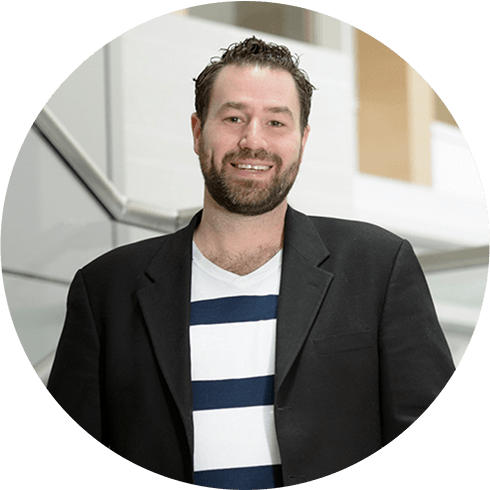 Enter NeuroTrition's Dr. Matthew Hill, who is also the Executive Director of the Canadian Consortium for the Investigation of Cannabinoids, the former President of the International Cannabinoid Research Society, and associate professor at the Hotchkiss Brain Institute of the University of Calgary. In this enlightening talk, Dr. Hill will walk you through the current state of science and evidence of what we know about how cannabis affects the brain across the entire lifespan. He will touch on the effects of prenatal exposure to cannabis, the impacts of use during adolescence, the relationship of cannabis use to mental health and illness, what is the evidence for medical benefit and how cannabis impacts the aging brain. The relationship between the gut and the brain, or, in doc talk, “brain gut microbiome (BGM) interactions,” have become an important topic in many fields of medicine, psychiatry and neurology. There is, in fact, growing evidence that these interactions play a crucial role in human brain health and some human brain disorders. This represents a major paradigm shift in how these disorders are being viewed (and, as the scientific story builds, how they may be treated). Dr. Emeran Mayer, a gastroenterologist at UCLA’s Center for Neurobiology of Stress and Resilience and best-selling author of The Mind-Gut Connection will host a brilliant talk describing how early life events (including maternal nutrition, mode of delivery, breastfeeding, antibiotic exposure and stress) play a crucial role in establishing the basic structure and function of the system for the rest of a person’s life. He will also outline how, during adulthood, nutrition and mind-related factors (e.g. emotions, stress) can modify, but not fundamentally alter the early established BGM interactions. Based on these critical windows during the lifespan, Dr. Mayer will guide us on an exploration of how our guts might have quite a bit do do with our brains throughout our entire lives, and specifically with developmental disorders (anxiety, autoimmune, allergies, obesity), adult disorders (metabolic, cardiovascular disease, cancer) and neurodegenerative disorders (Alzheimer’s, Parkinson’s disease). The NeuroLife Sessions are designed to take what you’ve learned from the speakers and put it into real life relevance. 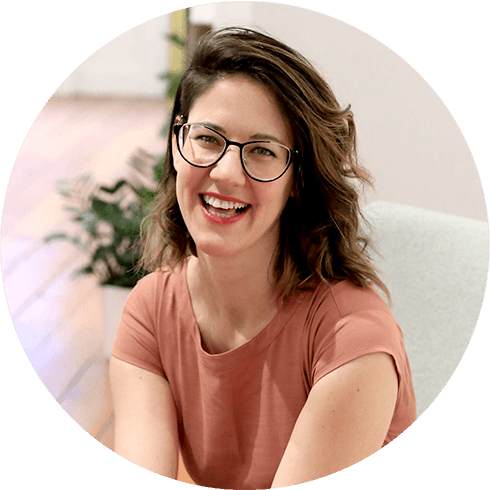 After each speaker in the NeuroSpeaker program, Orsha Magyar will present a NeuroTrition client case that really humanizes what the speaker talked about. Then, Orsha will outline the NeuroTrition Rx that was used for that client. If you haven't heard of our NeuroTrition Rx yet, it’s our proprietary 3-step process where we go from neuroscience research to nutrition protocols to brain food recipes! You will learn how to apply the NeuroTrition Rx to a pregnant mom and her baby, a teenager, someone who smokes cannabis and someone with gut-brain imbalance. 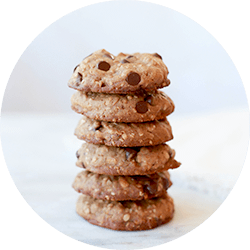 Everyone attending NeuroTrition Conference 2019 will get three Brain Food snacks from our E-Cookbook we’re working on. They're all made based on our NeuroTrition Rx - which is what we use with all our clients. And the best part? The snacks are delicious AND they're good for your brain! This is like your basic bad-for-you-but-delicious cookie done in a way that’s far, far less harsh on your brain. 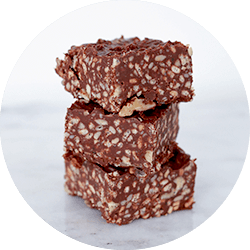 It's gluten-free and uses only high quality fats in its mix of seemingly random but oh-so-tasty ingredients. We’re serving the LOWEST glycemic fruits of them all - berries - and helping keep you off a blood sugar rollercoaster by adding healthy fats and proteins. Plus, it should go without saying (but it won't): these things are delicious. We all loved them as kids but let's be honest - they were not good for us. This is the next level, evolved brain friendly version you can enjoy guilt-free as an adult. Bonus: the extra brainy ingredients will keep you from crashing after the break. Learn lots. Eat great food. Meet smart people. The Brain Food Revolution is changing how we see the connections between what we eat (and what substances we may take), what happens in our brains and what that means over the course of our entire lives. Just a few short years ago, few had heard of it, now it's picking up steam in academic and general public circles. 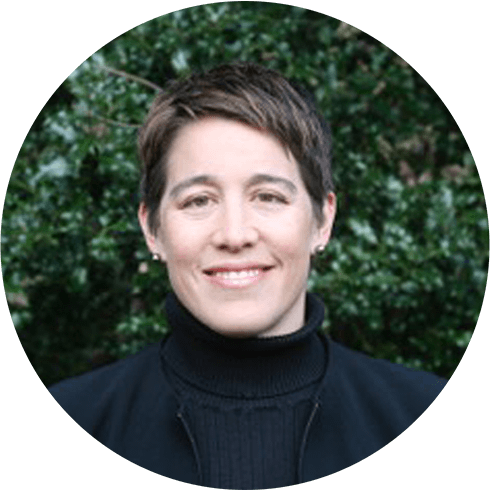 Orsha Magyar will lead a panel discussion of the NeuroSpeakers exploring this emerging phenomenon and field your questions on the Brain Food Revolution. We hosted our inaugural NeuroTrition Conference in 2017, with an all-star NeuroSpeaker program from four of our esteemed Science Council members. They delivered leading edge thinking on everything from sleep habits and stress eating to food addictions and the gut-brain connection. These stellar lectures gave you science-backed information – right from the experts’ mouths. And guess what? We recorded it all! 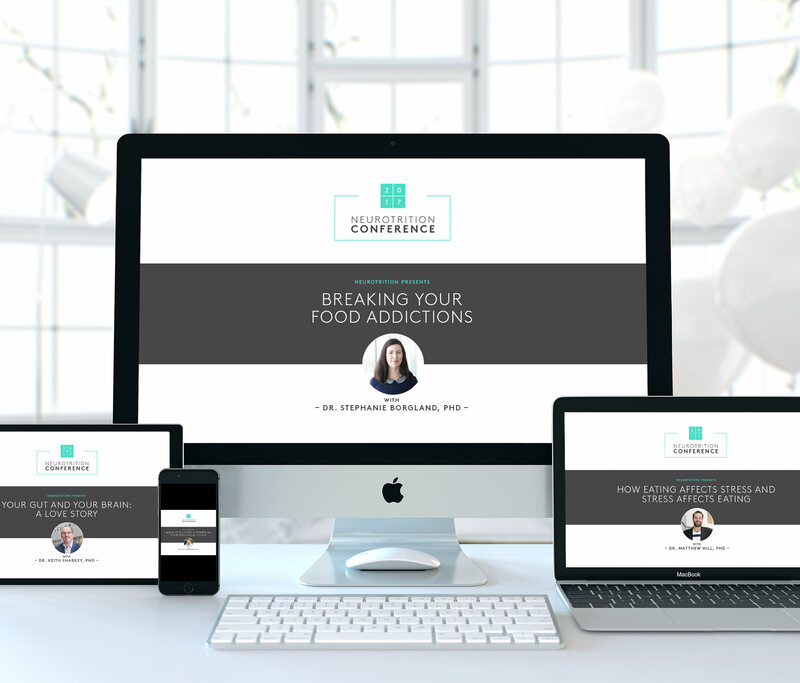 Our Conference Collection from the NeuroTrition Conference 2017 gives you 3 hours of engaging, science-backed video content, and we're offering a 50% DISCOUNT on it for all conference attendees. If you’re into brains (smart people AND the health of your noggin), then this is for you. More specifically, if you want to get the science straight from the scientists' mouths rather than translated by media or this-or-that celebrity “expert,” this is definitely for you. You will get the goods directly from the pros and, what’s more, you will get it in an easy-to-apply, real life kinda way. Want all this served up with brain loving snacks from our NeuroTrition Rx and lots of mingling and interaction? THIS IS FOR YOU. Will I get to actually meet and talk to the scientists? You bet. We’ve planned this event to have lots of time to ask your burning questions and just get to know these guys and gals (they’re not scary, I promise - just really, really smart). After each of their talks, they will be holding a Q&A session to answer your questions. I'll also be there for the Q&A in case the questions are more clinical (since they’re not clinicians). They will also be there to talk during the Brain Food Break. The scientists will also take more of your questions during the Brain Food Revolution panel, especially if they pertain to more than one talk and speaker (because their topics of baby brains, teen brains, cannabis, and the gut are pretty interconnected). Is Orsha going to be there to mingle and chat? Yes, of course! I’ll be running... errr... calmly walking around making sure all is going well and flowing smoothly. I will be giving the introductory keynote, introducing each speaker, facilitating the Q&A, hosting the NeuroLife Sessions, facilitating the panel discussions, and giving the closing remarks. But PLEASE catch me to say hello and talk during the event, I’d love to meet you! Plus, I will be free to chat in depth during the Brain Food Break. The biggest reason we chose to host the event in the afternoon is the parking. It opens up significantly after the morning at our beautiful venue, the Calgary Winter Club. There will be free parking right outside the entrance (our private entrance, I must say) to the event rooms. I don’t want anyone paying to park or walking from anywhere off-site to our event. That's not how we roll at NeuroTrition. I’m a student, can I get school credit for this? Why yes - yes you can! If you are a CSNN student, you will obtain 6 hours of external practicum credit for this conference. If you are a student at another institution, please speak to them about what they can provide and let us know if and how we can help you get some credits for coming! We're all over that! Is the food at the Brain Food Break allergy friendly? Good question! They are all gluten-free and either vegetarian or vegan. I can also say that there are dairy-free, egg-free and nut-free options (but one of the snacks being served does contain walnuts). If you want more specific info about what we're serving, just ask! I’m coming from out of town, I need directions, accommodations and food recommendations! We hear you, and we’re here to help. Please send us an email and we will help you find us! We can also offer recommendations of where to stay and where to eat based on your preferences or restrictions, budget and mood. I’ve eaten my way through this town, so I have you covered. I knew that would come in handy at some point. When and where is NeuroTrition Conference 2019? It's February 16, 2016 from 2:00-8:00 p.m. in Calgary, Alberta. The conference is being hosted at the Calgary Winter Club which you can find at 4611 - 14 St NW. We try and keep it simple. All tickets are refundable up to 7 days before the conference. After that, tickets are non-refundable. Tickets are transferable at any time. If you buy a ticket and can't make it, you can always transfer it over to someone else without any extra charge. Still have questions? Ask Orsha! I have questions for the scientists and I want to meet Orsha and I want to try the snacks and I want to join the Brain Food Revolution! Still have questions or need help? Email Orsha!